Every year, Mother's Day should be a glorious celebration. However your family chooses to celebrate the women in your life, the ladies will feel how much that they are appreciated. While bred in bed, brunch or a lavish dinner is relatively straight forward, the "perfect" Mother's Day Gift is a little more difficult. For this year's Mother's Day gift, give an item that benefits a worthy cause, a gift from GreaterGood. Shop.GreaterGood.com is a unique collaboration between GreaterGood and NOVICA. The mission of GreaterGood Shop is to give back to worthy causes. Through purchases on the GreaterGood Shop website, a portion of the sale goes to a worthy cause, with no extra cost to the consumer. This collaboration gives customers access to more than 3500 additional artisan products. The websites offers products to be sold on new channels, so GreaterGood can sell more items, raise more money for charity, and have a greater impact on people, animals, and our planet. When it comes to finding a Mother's Day gift, a few choices tend to be popular choices. One option that is always is appealing is jewelry. Since this gift option has many options, bracelets, necklaces, earrings, etc, the category can be a little overwhelming. Luckily GreaterGood breaks the category down with several options. From style to stones to charity benefited, gift givers can choose an option that best fits her personality. While exploring the jewelry category, I was drawn to the multi-gem bracelet category. Pursuing these bracelets, I found many that had both meaning and benefiting women's causes. The stacking bracelets from Uganda & Kenya are both eco-friendly (made from recycled magazines) and benefit the women who make them attain a living wage. Now when I wear these bracelets, I feel good about the purchase as well as look good with a beautiful product. For other women who have a specific cause that they support, like Breast Cancer, Autism Awareness, Veterans or several others, gift giving can be even more special. 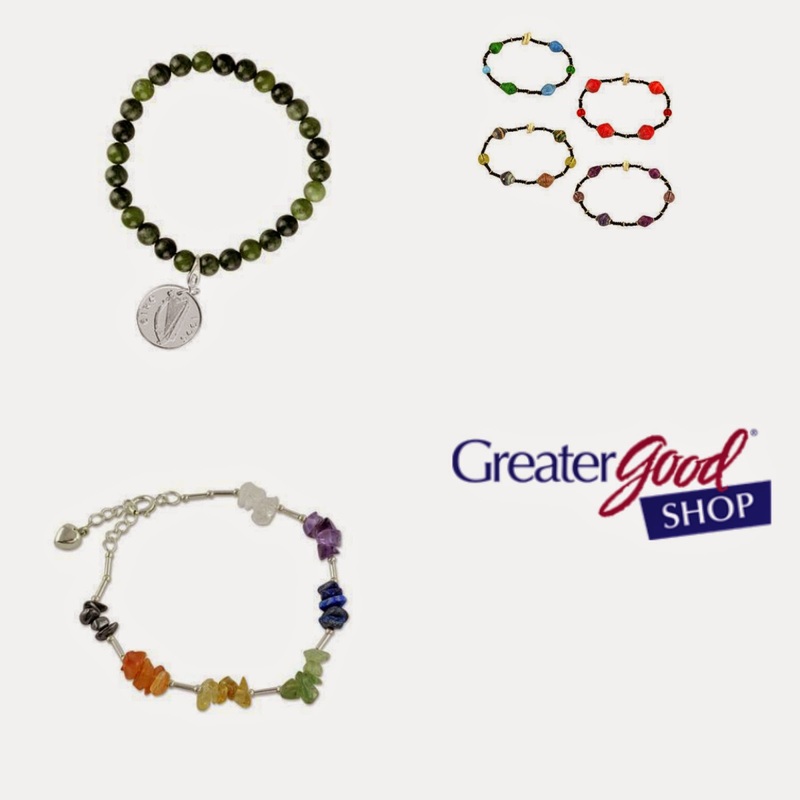 GreaterGood offers a wide selection of gift items that represent and support these specific causes. With so many options for gifts, I created a little gift giving suggestions. These selected bracelets feature both parts of my heritage and items to help me find inner calm. The Irish Penny bracelet reminds me of the luck of the Irish that my grandmother always believed. The multi-gem bracelet focuses on balancing my inner peace. Worn with any outfit, these bracelets look great. Would you like to shop GreaterGood for the woman in your life? I have a $50 gift certificate to give away. Please use the Rafflecopter to enter. Disclosure: I received a gift card to use and to giveaway for purposes of this post. All opinions are my own.